What are the odds that I would have been out of town for the first three weekends in April? Now that the orange month is almost at its end, I am SEW happy to have a home day! These poor little butterfly blocks have been sitting here so patiently, waiting to be sewn. They will get their turn first and then I will see what other orange mischief I can come up with before it is time to switch colors. AP testing starts Monday, that is the point at which regular teaching is just a faint hope for the upperclassmen. Senior boards were Thursday and the senior prank followed on Friday, so they are truly, officially, feeling that the end is in sight. I must say, I was a fan of this year's Christmas in April theme. We all arrived at school on Friday morning to a giant sleigh on the front lawn with fake snow and artificial trees decorating the pavilion. So many rolls of wrapping paper! The kids had a holiday dance party in their pajamas and Christmas sweaters. They did, eventually come to class, but regular lessons were not really part of the plans. My freshmen still have two weeks until their end of course exam, so hopefully they will be a little more cooperative so that we can get some quality review time in. Misterlinky is below, please share your orange progress. Mine is woeful and small, so seeing all your beautiful projects is an inspiration. So sorry for the delay. Here, better late than never, is the Saturday linky party! For some reason, the blogger app on my phone does not handle the html code for the linky party. I discovered this, of course, as we stood in line this morning for the Eversest Ride at Animal Kingdom. Yikes! Nothing to be done though. We all came back to the hotel for lunch though, and the kids have decided that the lines are too long right now and they will stay at the pool until after the awards banquet tonight. So nice to have a chance to relax for a bit. Hopefully you will all be able to post now, thanks so much for your patience. I am relatively sure that this is the last weekend for a while that I will be working. Looking forward to a weekend at home in the very near future! I know that I seem to keep saying the same thing every weekend this month, but I'm busy working and can't seem to find any time to sew. Today it is a districtwide AP Biology Review Day. Hopefully you are all busy playing with orange though? I know that some of the m&ms for our chi square analysis will be orange. After all the fun is done, I'll come home to enjoy your sewing until mine is back on track again. Misterlinky is below. 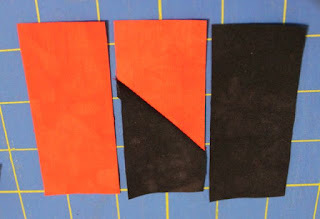 This month's block will need 1.5 inch strips of orange and black, dark and light orange, or orange and background. Any two colors with decent contrast should work well. It is a four patch block, and each quarter will need 3.5 inch strips in each color as well as 2.5 inch strips in each color. Start with the 2.5 inch strips. 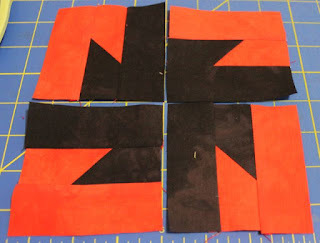 Lay them right sides together with so that the orange is perpendicular to the black. Imagine that you are sewing to binding strips together -- it is the same orientation. 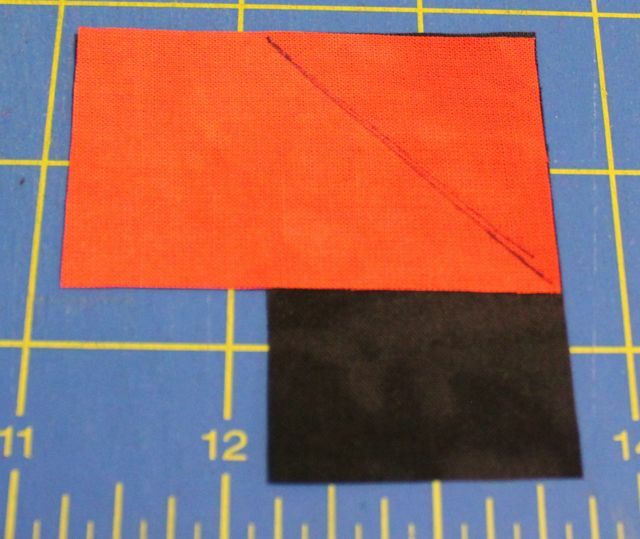 I chose to sew this block with the orange angled to the left. Draw a line from corner to corner along the waistband of the "pants" and then sew along the drawn line. Never sew through the crotch -- ouch! Once you have sewn the strips together, open it up to make sure it is sewn correctly. If all is well you can trim away the triangles of fabric behind. Repeat the same procedure for each of the four subunits. Each one should be 3.5 inches. 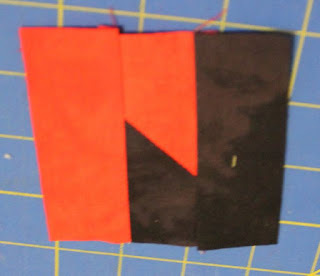 Now all you have left to sew is a simple rail fence block. 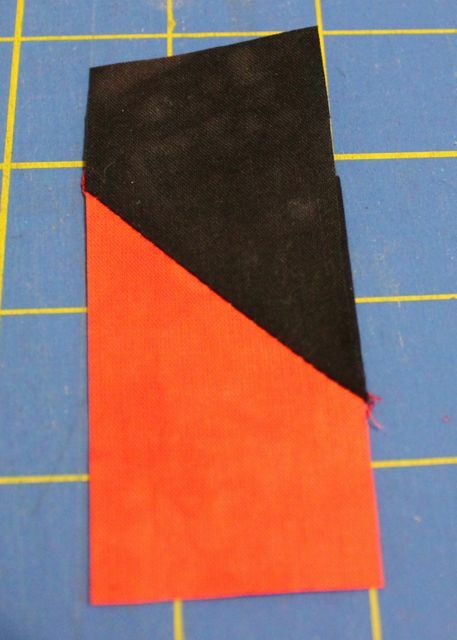 Line the three 3.5 inch strips up so that the short side of each color buts against the same color rail. 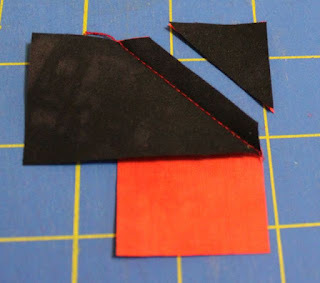 Sew all three rails and iron the seams away from the center of the block. Repeat for all four subunits. Next, arrange the blocks so that the darker fabric (black for me), is facing the center of the block. Each subunit is rotated 90 degrees around the center axis to give you the pinwheel effect. I hope everyone is enjoying a great orange month so far! I am still at a conference and have limited wifi. I'm actually hot-spotting from my phone right now, so I will keep it brief. Misterlinky is available for anyone who would like to share. Quilt Swissy at Quilts and Dogs is the winner of the April bundle of hand dyed fabric from Vicki Welsh. There will be another drawing next month, so be sure to visit again. The April Sampler Block is done! I fixed the measurements from the original tutorial. All the photos are taken to write a new tutorial and I am taking my computer along to the conference. Hopefully I will be able to write up the directions during the evenings. I am envisioning half of these spinning one way and the other half spinning the other way so that the long pinwheels will stagger in the finished row. So Kurt got back last night from a business trip. He was in DC for the week. He knew that he had to come back early so that I could go to my conference, but I guess with him gone we didn't communicate about the details. He was pretty sure I was supposed to pick up the kids after school today. Hard to do when I'm in Orlando! Then he wanted to know what time I would be back. He looked awfully puzzled when I said Saturday. He had no idea I was staying in a hotel during the conference and not commuting. Big sigh. Travel is hard on everyone I guess. I am super excited though. One of the keynote speeches is by Sir Ken Robinson. I am really looking forward to it. I can't believe that it is April 6 already and I have not yet put together a tutorial for the April Sampler Block! I knew April was going to be a super busy month, and I was so much not wrong! 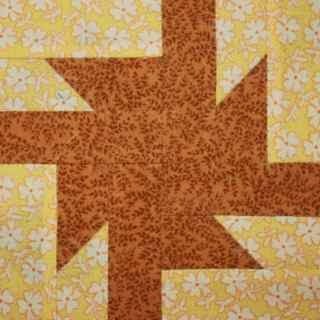 April's block is called a Wacky Pinwheel. I did a tutorial for it in June of 2014. I wanted to clean up the tutorial a bit and streamline the measurements. Maybe I can get started as soon as I finish packing?! I'm off for three days for a conference on brain based learning. If you are ready to get started though, the original tutorial will at least get you started. It is a 6 inch block. 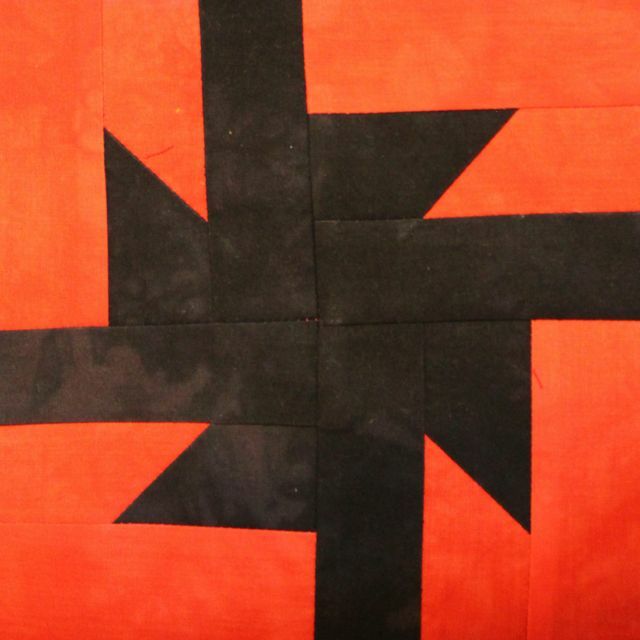 So that means you will need 12 blocks for the large quilt and 9 for the small quilt. Thanks for all of your patience. May is going to be so much calmer. I am almost sure of it. March flew by in the blink of an eye. April promises to be even busier, so I plan to enjoy some fabric fun while I can. Orange is the color for April, with optional hints of black or brown. Monarch butterflies were the inspiration. A lot of people have issues with orange. It was something I had very little of in my stash when I started working my way through the rainbow for the first year of the Rainbow scrap challenge. 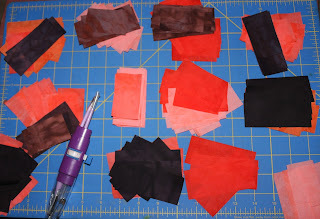 I have a nice little assortment now though, and in small doses, it adds a nice little pop of color to my quilts. 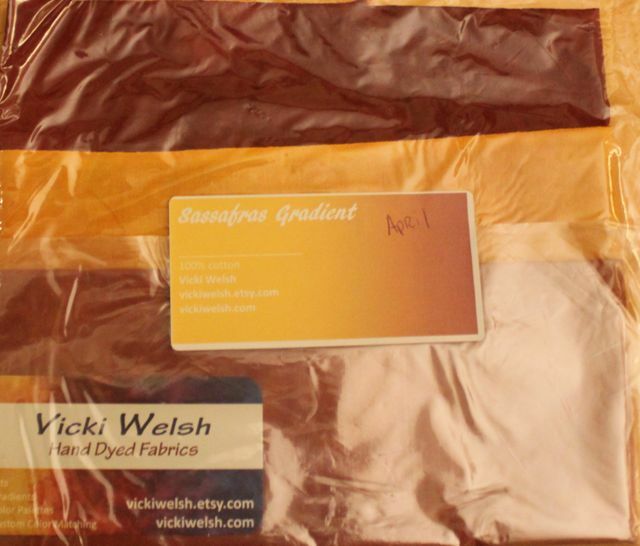 The fabric giveaway for April features hand dyed fabric from Vicki Welsh in the Sassafras Gradient. To enter the drawing for this beautiful bundle, just leave a comment on this post with one quilting goal for the month. 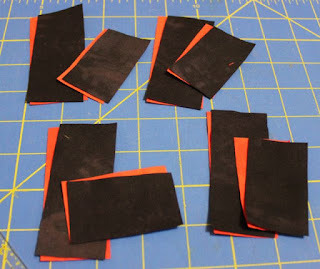 First on my list this morning is to make the April Sampler block and write a tutorial. The block is called sparkler and I'll update give links as soon as they are ready.